As we’ve just mentioned above, CloudWays is a top-rated provider of cloud hosting services. The company was founded back in 2009 by Aaqib Gadit, Uzair Gadit, and Pere Hospital, and has its headquarters based in the Malta island, Europe. The company also have offices in other parts of the globes—namely Dubai and Spain. The company’s top mission is to offer you fully managed cloud hosting solutions so that you can concentrate on the business side as the platform handles all your hosting issues expertly. CloudWays boasts of a big workforce of more than 30 staff who have helped workers over 8,000 users from up to 43 different countries to launch over 25,000 web apps and over 12,000 servers. The set of features offered by any hosting company determines its reliability and performance. When it comes to CloudWays, we were pleased to note that it offers its customers some of the most powerful features not provided by their competitors. In this section, we’ll take you through a list of the top features and benefits you’ll enjoy using CloudWays cloud hosting services. One of the most powerful and useful features that users love about CloudWays is the server monitoring. They make it possible and easy for you to view various variables such as incoming traffic, idle CPU, reads per second, among others via a drop-down menu. Even better, they provide you with a graphic representation of your load on the cloud server. As you already, real-time monitoring of your server resources is crucial for your website performance! Another impressive feature that seems to attract many people to CloudWays cloud hosting platform is the completely free backups they offer all their clients. Unlike most of its competition out there, CloudWays lets you set automatic backups for your cloud server images. We appreciate the fact that the company gives you the option of setting the server to automatically back itself up on a daily basis or after 2 days, 3 days, etc., with the maximum backup frequency being 7 days (or 1 week). Alternatively, you can also choose to back up your serve anytime with a single click of a button. Well…unlike other hosting providers who will charge you around $2-20 for backups, CloudWays does it for your 100% FREE of charge, without asking for a single dime from you. A hosting platform that offers you free website migrations is a cause to celebrate! Because not many platforms will help you migrate your already existing site from one host to a better one. Again, thumbs up to CloudWays for taking care of their customer site migration process at NO additional cost! Developers who want to test as well as coordinate their projects will be pleased to note that CloudWays offers them a cool environment to do so. Heck, you can even use the RESTful API to facilitate your scripting operations! The integrated staging mechanism enables you to hassle-freely move your new codes to the testing environment. We’ve previously mentioned that one of the most useful features of CloudWasy is allowing you to monitor your server resources in real time. The story gets better when you discover that you can even go ahead and take away or add server resources at any given time—thanks to the vertical scaling feature. This feature comes in handy when your site is suffering from a traffic surge…say when your site gets high traffic in a given season. With the CloudWays’ vertical scaling, you’ll simply need to upgrade your plan to meet your website traffic needs. Remember the cloud host provider has a pay as you go plan, which enables you to only pay for what you use and not what you won’t even use with time. CloudWays is basically a platform-as-a-service and allows you to choose whether to choose your WordPress site on cloud servers from Amazon Web Services, DigitalOcean, Vultr, and Google Cloud Platform. 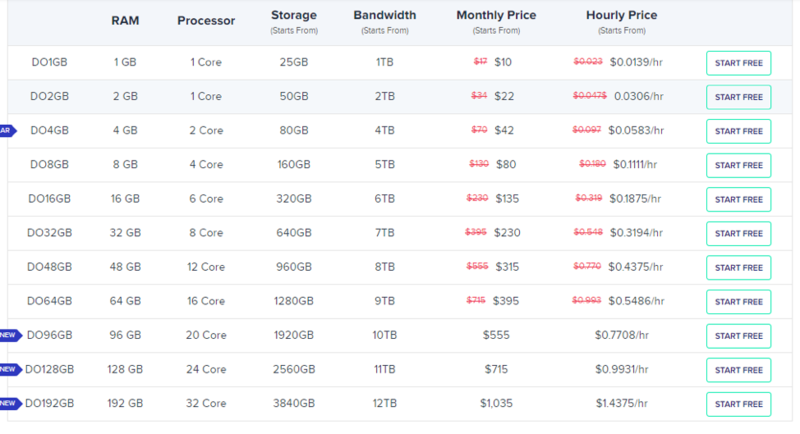 As you can see from this screenshot, the company offers you serval pricing plans to pick from. Each package comes with a 30-day free trial. Their lowest plan goes for $10 only for 512MB RAM—which makes it affordable to everyone, including those on a tight budget. There’s a reason why CloudWays will appear on every list of top-rated cloud hosting service providers. And that reason is…they’ve got a genuinely robust cloud-based system. They state that their systems are optimized for maximum performance and reliability. Part of what makes their services high reliable is the fact that they have partnered with the some of the best cloud providers in the hosting world. This enables them to provide you with 99.99% uptime and incredible loading speeds of about 400-500 milliseconds. This is good news to all online business owners, given that your page load speed can drastically affect your rankings on Google search engine. From these numbers, we can safely say that CloudWays offers you 40-50% better loading times than what you usually get from the regular hosting services out there. Affordable, pay as you go pricing. Installer supports 12 apps only. Not for everyone; requires some level of expertise. Just like many other web hosting companies, CloudWays offer you a number of ways through which you can reach out to them for professional assistance. You can contact their support team through live chats, tickets, email, and even phone call. Their support team is always available 24/7/365 to attend to all your questions and give you expert solutions. If you want fast response, you can always consult the CloudWays Bot for quick assistance. hosting, saving you the need to contact the manufacturer. That’s all there’s to know about CloudWays cloud hosting platform. From our discussion above, it’s evident that this company will offer you the best cloud hosting experience at a pocket-friendly cost. They come with truly remarkable features like vertical scaling, server monitoring, FREE backups, and FREE site migrations. Not to forget their incredibly reliable performance (with 99.99% uptime and super-fast page load speeds). With their first-class customer support (multiple ways of reaching out to them), you can rest assured that you’ll get timely assistance for any queries or issues you have with their services. Overall, CloudWays is a Powerful and FAST cloud hosting platform for the expert level users!